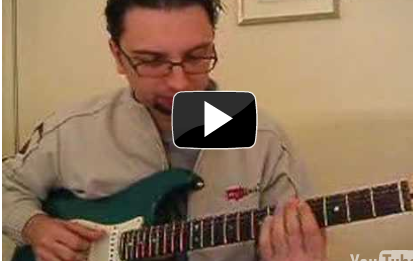 This is an introduction to how to use the right scale for the chord of the moment. I will not be talking about modes yet as I find this creates a bit of confusion at this stage. We have seen how on every degree (=note) of the scale we can build a triad of some kind and add a 7th to it. 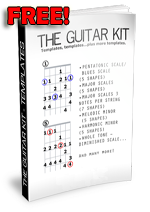 These are three examples so you can have the most popular ‘chord shapes’ to play with and on 3 different string sets. The first is an example in G major: the roots of the chords are all on the 6th string. To find the correct scale for the chords just play a G major scale starting from the degree the chord sits on (like I do in the video). And so on…I am sure you get the idea. 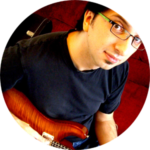 I really enjoy your videos because you are a fine guitarist who also happens to be a very fine teacher. Some cats who are are excellent musicians just don’t possess the ability to teach with clarity and understanding. Thanks for sharing your knowledge and time. I want to ask about your Strat in the chord exercise video. First of all it sounds beautiful and full. (And thank you for NOT using overdrive or distortion…your sound is pristine.) What color is your Stratocaster? Is that a custom color? I dig it.